For the architects of the inopportunely named Warsaw summit on ‘Promoting a Future of Peace and Security in the Middle East’, timing is everything. In a not-so-remarkable coincidence, the start of the two-day gathering this Wednesday was quickly followed by one of the deadliest terrorist attacks to rock Iran in years. The Warsaw meeting has also coincided with another high-profile summit taking place further east. Iran, Turkey and Russia are meeting on Thursday in Sochi as part of an ongoing effort to stabilize Syria. And although both summits are about the Middle East, they represent bitterly rival visions for the region’s future. In Sochi, leaders are seeking to pacify some of the world’s deadliest warzones and broaden bilateral cooperation based on mutual interests. Meanwhile, the guests in the Polish capital are looking to exacerbate regional tensions by building on foundations of common hostility towards Tehran and lining up behind a terrorism-fuelled anti-Iran agenda. Some of these attendees include “Israel’s” Benyamin Netanyahu, US President Donald Trump’s senior adviser and son-in-law, Jared Kushner, as well as high-ranking officials from Arab monarchies in the Gulf. 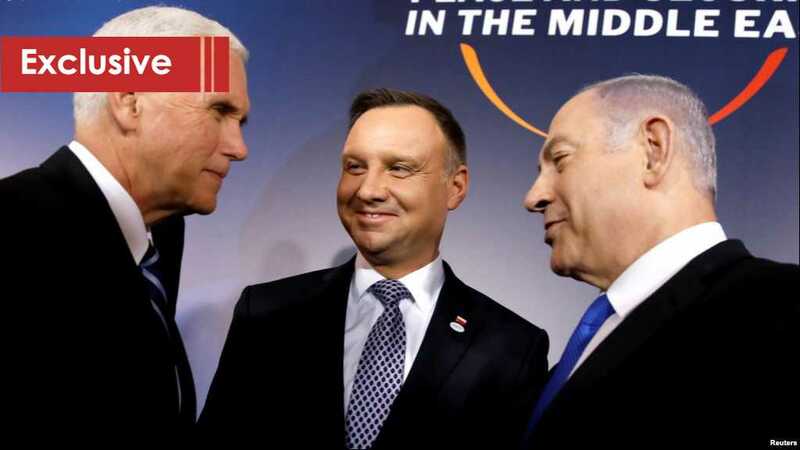 The Warsaw summit is the chosen venue for bringing them all together in what Netanyahu described as advancing the “common interest of war with Iran”. So much for promoting ‘peace and security’ in the Middle East. Although Netanyahu later backtracked on the comments, the summit will undoubtedly attempt to advance the rapprochement between Tel Aviv and Riyadh and possibly lay the groundwork for the official unveiling of the Trump administration’s so-called “deal of the century”. Kushner will travel to the Gulf just days after the summit wraps up, where he is due to present the ‘economic portion’ of the deal, which presumably includes financial incentives for Palestinian factions. Interestingly, the conference in Warsaw began less than 24 hours after Moscow hosted reconciliation talks between Palestine’s Hamas and Fatah factions. Experts are convinced that the deal is ultimately designed to put the final nail in the coffin of the Palestinian struggle for an independent state – a key pillar of the Islamic Revolution – and, of course, diminish the role of the Iran-led resistance axis in Palestine. That said, there is no shortage of challenges facing such an ambitious agenda. For starters, the Palestinians are refusing to play ball and have ruled out any negotiations with the “biased” Trump team. Meanwhile, the Warsaw summit is as much about those in attendance as it is about those who are staying away. Aside from the Palestinians, the non-attendees include Qatar, Turkey, Lebanon, Russia and of course the Iranians themselves. And then there is the European Union, which remains strongly supportive of the 2015 Iran nuclear deal. Since the Trump administration withdrew from the landmark agreement last May, the Europeans have repeatedly resisted Washington’s push for a confrontation with Iran. Last month, the EU set up a financial mechanism designed to avoid US sanctions against Tehran and keep the nuclear deal afloat. Perhaps not surprisingly, the EU foreign policy chief, Federica Mogherini, boycotted the Warsaw event while France and Germany are dispatching junior officials. The sheer fact that Poland – a country with no history of involvement in Mideast affairs – was chosen as the setting of the summit underscores Europe’s disproval of the agenda and the refusal of all major European capitals to host the conference. Even the Poles have tried offering assurances to Tehran that nothing too inflammatory would emerge from the gathering. As such, the Warsaw summit does much more to highlight differences over Iran within the Western camp than it does to isolate the Islamic Republic. Perhaps, it was Iran’s Foreign Minister Mohammad Javad Zarif who offered one of the more accurate descriptions of the two-day event, calling it “dead on arrival”. According to Zarif, many of 60 countries attending the summit informed Tehran that they were pressured into making an appearance. “They [the Americans] used the leverage they have with various countries in order to attract more people to this conference,” Zarif explained. Whatever the numbers, the Warsaw summit was certainly never going to do much for Mideast peace or lead to a more concerted Western effort to ‘counter’ Tehran.